Have You Ever Wondered What to Look for When Buying A Used Golf Cart? Trying to buy a well-used golf cart may not sound difficult, but that doesn’t mean knowing how to look for a few key features won’t help you in your search for the best deals. We’re going to attempt to highlight some of the steps to go through when looking for the best used or refurbished golf carts so that you can put more time into your swing instead of the search. As a market worth more than one billion dollars, many find themselves buying used golf carts as a means of transportation, both on the golf course and off. Naturally, the market for used golf carts has become just as large, and the introduction of electric golf carts both new and used has created a green alternative to other vehicles in many areas of the world. Price is probably the first and most intimidating thing you think of when considering buying a used golf cart. But for those who want to save money and avoid buying one new, the differences can be significant. But the value is there as buying a new cart can sometimes cost ten to twenty thousand dollars. Buying a used golf cart can sometimes cost you merely a quarter of that. Some people worry that such a big difference in price can mean a drop in quality. Have no fear though as the reality is many golf carts have become personalized or stylized to show off one’s lifestyle. While that can be nice for new golf cart owners, a used golf cart can provide all the utility required without the extra cost that the flair of a new golf cart might otherwise need. This has led to many satisfied owners of used golf carts purchasing their new device for two anywhere from two to five thousand dollars. That alone can mean a significant improvement for someone shopping for golf carts on a budget. Plus, the value of a used golf cart will make itself evident after your first couple of drives meaning you save more in the long run. Many consider them efficient forms of travel in areas where cars and larger vehicles simply aren’t viable. While nearly fifty percent of all golf cart purchases are in the United States, countries such as China have seen ownership skyrocket in recent years as golf carts are useful in urban environments and population centers as alternative means of travel. Surprisingly, there is one question you should focus on of far more concern than brand or model. The battery can be the first thing to look at when wondering what to look for when buying a used golf cart. Used golf carts can be either electric or gasoline powered, and both come with concerns to consider when looking for a used golf cart. Electric batteries sometimes lack the power for heavy loads and must be recharged, making them good for shorter travel and more recreational use. Gasoline golf carts, on the other hand, are a bit more powerful and show greater longevity but are less environmentally friendly. The wear you plan to put on the golf cart should definitely be considered when making your choice. This can translate into what type of passengers your golf cart can provide for. Many golf courses provide an option for recharging an electric battery at a charging station. Electric golf carts are often only capable of carrying one extra passenger as well, limiting its uses over long distances further. On the other hand, gasoline powered golf carts can provide enough power for four seats. Whichever you choose, you should be wary of batteries with three or more years of use though. Golf carts often use lead lined batteries that begin to show wear by this point. If you purchase a golf cart with an original battery or one that has several years’ worth of use, then you can expect to run into problems sooner rather than later. You should also avoid using golf carts that are sold “as-is”. This phrase often implies that they have received minimal or no maintenance since the seller decided to relieve themselves of the golf cart. Buying one of these used golf carts can mean putting in costly repairs before you ever get to enjoy the fruits of your new purchase. It might seem like a simple question, but many people pause when wondering how to buy a used golf cart. Luckily the answer can be simple as many providers of new golf carts are also willing to sell older or used versions of their golf carts as well. Often golf courses or providers other than the manufacturer are eager to sell golf carts that have seen use on their course as well. Some people attempt to purchase used golf carts online with key phrases like “how to buy used golf cart” through Google or other search providers, and while this approach will usually work buying from a local shop is often easier. Golf carts require maintenance similar to other vehicles, so golf courses and stores often have garages that rebuild and sell used golf carts just like cars. With the fact that many companies who produce new golf carts are also willing to part with their older models established, you may now be asking who some of these providers are. While several companies have claimed to be the number one provider of golf carts in the world, we can provide several names to look for when doing your shopping as well. Marshell Electric Vehicle Co Ltd. is a Chinese owned company with the largest golf cart producing factory in the world. Considering China has the largest population in the world and is the fastest growing market for golf carts, the number of new and used products should be no surprise. Yamaha Motor Corporation in the United States is another producer of golf carts. Their factory has produced over three million golf carts. Needless to say, with that many new unit on the market, they have a large number of used golf carts out there available for purchase as well. Some may even be in the stores of local sellers near you already. EZ-GO is a large provider of golf carts and a subsidiary of a New England based company named Texron. As part of a corporation providing ATVs to many countries across the globe, EZ-GO has one of the widest range of product types for golf carts. Both electric and gasoline golf carts may come bearing the stamp of EZ-GO in particular. Of course, once you purchase a used golf cart you may want to know where you can enjoy your vehicle. The golf course is an easy answer, but if you want to use it for more than recreation there are several cities that have developed in recent years to favor the golf cart connoisseur more than other modern vehicles. In recent years the state of Florida in the United States has been especially progressive in this regard. The largest golf cart city in the world is known as The Village, an area in Florida complete with bridges and roads designed exclusively for golf cart passage. Ocean Reef is another golf cart entrepreneur who values golf carts for their low impact on the Florida Keys ecosystem. Peach Tree, Georgia just to the north is even encouraging younger generations to embrace the golf cart lifestyle. Many businesses throughout the community have golf cart only parking, and students as young as twelve years old with supervision are encouraged to use golf carts to commute to and from school to make travel a breeze for everyone in the community. The United States isn’t the only country encouraging more golf cart based communities, however. China has cited a desire to replace cars with streets full of golf carts, and are laying out the groundwork for a restructuring of city streets for more golf cart focused travel. Many delivery services have already adopted them as their means of travel in anticipation of such an event. 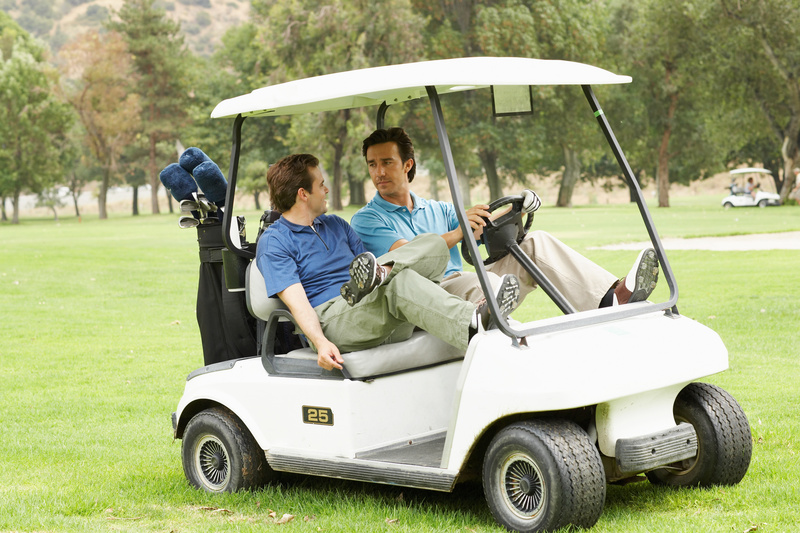 Buying a used golf cart can help protect one’s wallet while being both goods for the environment and a fun way to get around during your favorite pastime. Many communities around the world are already adopting them as a formal means of travel both on and off the golf course. Hopefully, this guide helped you with what to look for when buying a used golf cart, as well as finding a place to drive and enjoy your new purchase. A golf cart can benefit you for years and acts as an alternative means of transportation in a market that will only become larger and more valuable in the years ahead.